Wailuku River is the longest river in the state of Hawaii. Rainbow Falls on Wailuku River, the longest river in Hawaii. Hawaii is one of the states in the US situated in the Pacific Ocean. It is comprised of 8 significant islands and numerous tiny islands. The state has a wealth of landscapes from volcanoes to exquisite sandy beaches. Additionally, many beautiful rivers and streams flow through Hawaii’s many islands. Some of the longest rivers that run through the islands include Kaukonahua River, Waimea River, Wailuku River, Kolekole Stream, Hanalei River, Kaukonahua Stream, North Fork Wailua River, and Anahulu River. Hawaii’s longest river is Wailuku River. The river is found on Hawai’i Island fondly referred to as the “Big Island.” It measures 28 miles and flows from Mauna Kea mountain slopes and drains into the Pacific Ocean. Many waterfalls are found on the river including the Boiling Pots and Rainbow Falls. The second longest river in Hawaii is Hanalei River. It is situated on Kauaʻi Island. It has a length of 15.7 miles. Hanalei River runs from Mount Waiʻaleʻale and flows north to drain in the Pacific Ocean. It provides water for irrigation to the majority of Taro farmers on Kaua’i Island. The river flows through Hanalei National Wildlife Refuge. Wailua River is Hawaii’s third longest river. It is situated on Kauaʻi island of Hawaii. The river is formed at the meeting points of North Fork Wailua River and South Fork Wailua River. Wailua River is famous for kayaking. It flows through the Wailua Falls and onwards into the Pacific Ocean. A bird refuge center is situated along the River. The Kolekole stream is also one of Hawaii’s longest streams. It is located on the Island of Hawaii and has a length of 12.4 miles. The river flows from Mauna Kea Mountain, goes through a rainforest, and end in the Pacific Oceans. The stream passes through the Akaka Falls - Hawaii’s highest falls. Waimea River is one of Kauaʻi island’s major rivers. The river is 12 miles long and flows from the world’s highest swamp - Alaka'i Swamp - and goes through the scenic Waimea Canyon and drains into the Pacific Ocean in the south of Kauai Island. One of the major rivers in Oʻahu Island of Hawaii is Kaukonahua stream. The stream measures 9.9 miles excluding its South Fork. The total length of the stream including the South tributary is 28 miles making it one of the longest rivers in Hawaii. The river’s final destination is the Kaiʻaka Bay. Anahulu River is on Oahu Island in Hawaii. It measures 7.1 miles. The river’s source is the Koolau Range, and it flows downward passing through Wahiawa to drain into the Waialua Bay which is connected to the Pacific Ocean. In the 19th century, Anahulu River was an essential source of water used to irrigate farms on the river’s valley. Honokohau Stream is on Maui Island of Hawaii. 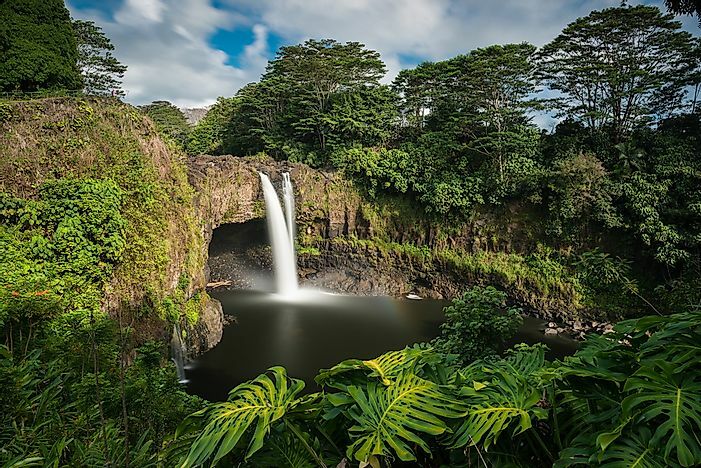 The stream flows through the Island’s tallest waterfall - Honokohau Falls. The stream originates from the Puu Kukui Summit and drains into Honokohau Bay. Kalihiwai River is one of Hawaii’s longest rivers found on Kauai Island. It measures 10 miles and flows through a tropical jungle before draining into Kalihiwai Bay. The river is well known for kayaking. Huleia River is situated on Kauai Island in Hawaii. It is 5 miles long and goes past Huleia National Wildlife Refuge. The river is a popular site for kayakers on the island. Hawaii is located approximately 2,000 miles from the US mainland and like Alaska, it does not border any other US state. It is also the southernmost state in the US and the only state in the country which is not located in North America. Out of the eight islands, only seven are permanently inhabited, and the island of Ni’ihau is privately managed, and access is restricted by the managers. The tallest mountain in Hawaii is Mauna Kea extending to 13,796 feet high from the mean sea level. However, when measured from the base which is on the floor of Pacific Ocean it reaches 33, 500 feet high, making it taller than Mt Everest.